I am absolutely obsessed with the faux fur trend all year long. I love everything fur-- fur coats, fur vests and even fur clutches (have you seen these this season?). I am sharing a dressier fur look on the blog today. Stay tuned for a more casual fur look in a letter post!!! 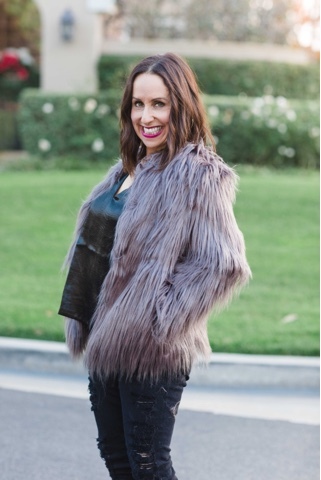 I picked up this amazing faux fur jacket at one of my favorite boutiques, Style Society. I love the color--gray!! How fun is that!! I decided to pair it with a fun black Minkpink tank and some coated skinnies. I added some great black booties and a skinny choker and I was ready to hit the town!! This is such a great look for a date night with the hubs or dinner with my girls. 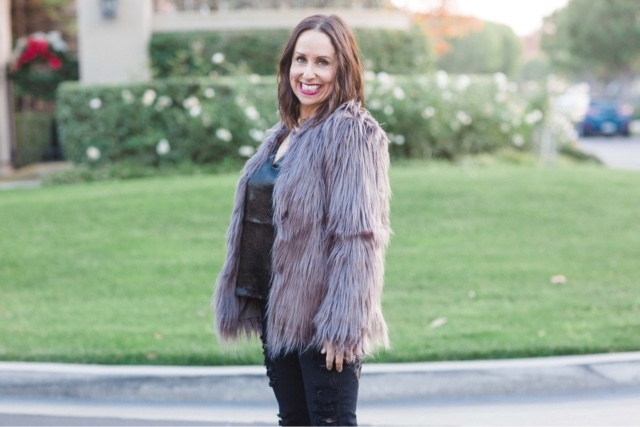 I highly recommend that you grab a faux fur jacket to add to your current wardrobe. I think you will be in love!! Thanks to Taylor Cole for photos and you can shop this look by clicking on the links above!! And please leave me some comments on what you think of the fur trend. I would love to hear from you!! Happy Reading!! !